45 North was again selected to provide live streaming coverage of the Ricoh Sport Nova Scotia Awards. As in years past, these awards celebrate the outstanding achievements of athletes, coaches, officials, sponsors and volunteers from around the province – all of whom have contributed to sport in Nova Scotia. These individuals represent the best of amateur sport, not only by virtue of their athletic achievement but also through their dedication and commitment to sport. 45 North Broadcast Group, Atlantic Canada’s premier video service provider, was a proud sponsor of the 2011 Canada Games in Halifax. 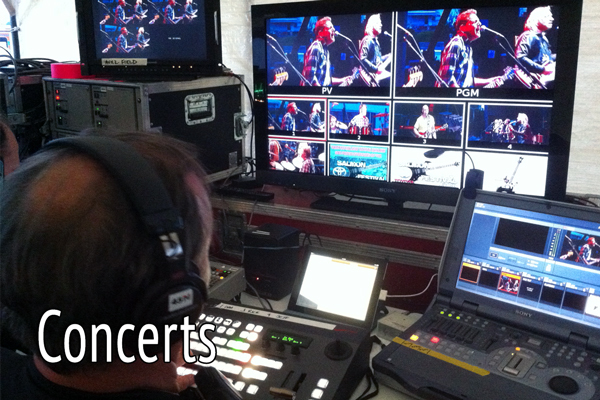 In February 2011 we provided event video feeds for the Canada Games webcast partner BellAliant and our multi-camera IMAG coverage of the Celebration Square Concert Events. 45 North provided our Multi-Cam IMAG production services for the Benefit Concert at Halifax Metro Centre to aid with earthquake relief after the Haiti earthquake. Ocean Entertainment chose 45 North for production services on their six part variety series for APTN and APTN HD. 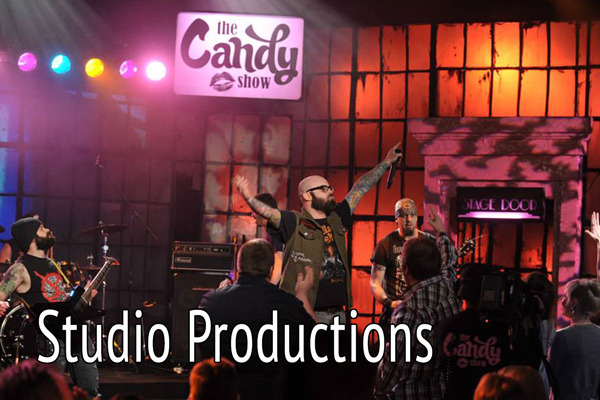 The Candy Show is a night time variety program showcasing the talent of the East Coast of Canada. In each episode Candy brings her musical guests into a replica of her high school bedroom to conduct her very unique interviews. 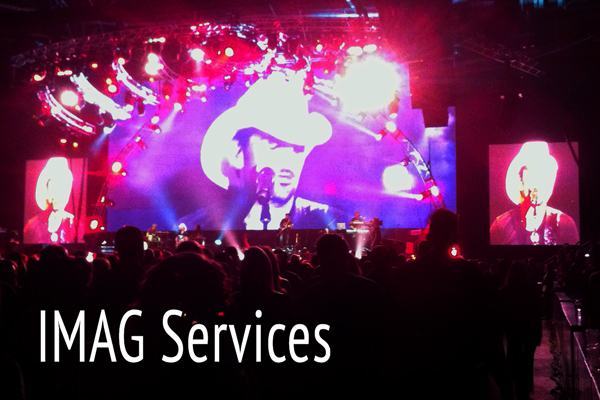 45 North was chosen to provide their proven Multi-camera IMAG support and crew for the two day concert series with headliners the Black Eyed Peas and Alan Jackson at the Halifax Common event. Comedian Dane Cook put on a live show at the Moncton Coliseum and 45 North was chosen to provided our proven 4 camera airpack and crewing for the IMAG. 45 North was selected to provided cameras and crew for a significant corporate event for Sun Life Financial, where Halifax was one of 5 locations across the country, linked live via satellite. The 2009 ICF Canoe Sprint World Championships, the largest international sporting event held in Atlantic Canada to date, chose 45 North to provide over 35 hours of Multi-Cam Broadcast Coverage during their week long event. 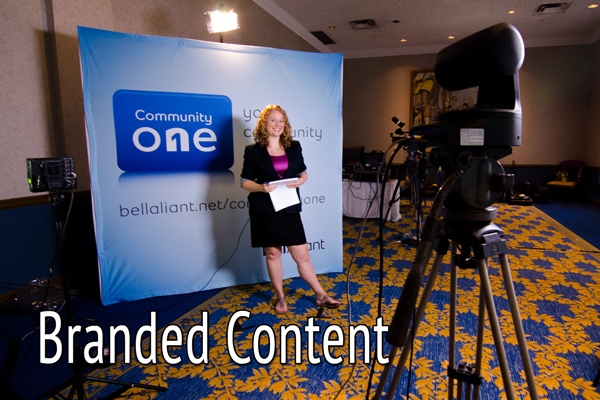 Our expertise in Live Event Coverage provided the Organizers with terrestrial, satellite and web video feeds from Lake Banook to millions of viewers and fans on every Continent. 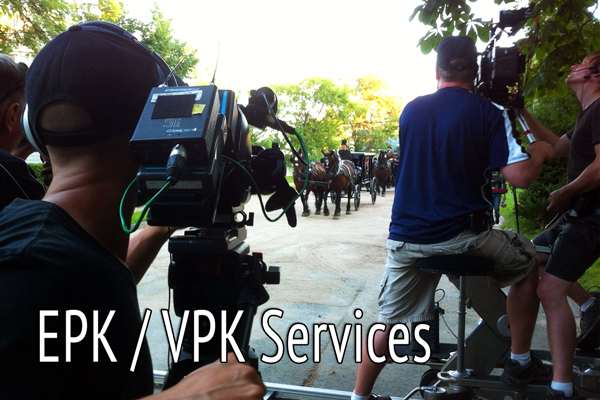 Halifax Film, a DHX Media company in association with CBC Television chose 45 North to provide TD/TP and Crewing Services for their multiple participant backgrounder & location filming, in locations across the country, and then for the final studio productions. Canada’s Super Speller, hosted by CBC’s Evan Solomon (CBC News: Sunday), is an entertaining and educational 5 x 1 hour episode series that determines which young contestant’s performance ultimately spells S-U-C-C-E-S-S! DID SOMEONE SAY - CONCERTS? The 2007 Canadian Antiques Roadshow team has chosen 45 North to provide Digibeta cameras and accessories for their current Canadian tour. This year the production starts in Vernon, BC, and they work their way east to Charlottetown, PEI. Watch for this highly rated series on CBC TV. “From Ship to Shore” is series of information videos produced, in two languages, by 45 North and Javitech Ltd. for The Fish Quality Project Advisory Group. The videos describe, in accurate detail, the process and methods of modern, non invasive, harvesting methods for the groundfish and lobster industries. 45 North supplied our popular air-pack mobile, with 6 cameras and crew, for the production of a television pilot, produced by The Halifax Film Company. Shot at Electropolis Studios in Halifax, this new comedy concept (presently unnamed) will be used to shop the concept to potential broadcast customers. 45 North provided their Air-Pak Mobile, with 3 cameras, instant replay and crew to Advanced Systems to provide live to tape coverage of a mixed martial arts event in Halifax, NS. At the event 45 North demonstrated the versatility of the Sony Anycast System for use in small and medium sized productions. 45 North again provided both crew and cameras to Advanced Systems of Halifax, NS to provide multi camera coverage and IMAG Services for another exciting night of Amateur Boxing from the Halifax Forum. “Embracing the Challenge” is a descriptive video produced through 45 North and Kimberly-Clark Canadian Timberlands Division. The video highlights the beneficial results of modern harvesting methods and their benefit to this essential renewable resource. This video production chronicles a step by step harvesting methodology that can be easily applied by woodland operators of all sizes. 45 North worked with acclaimed Canadian painter Holly Carr to produce a pilot of a children’s series with a working title of “Holly’s Playhouse”. It is an innovative and colourful project, revolving around original children’s stories, and Holly’s unique method of painting on silk. Nova Scotia musician Scott MacMillan provides the soundtrack for this new project. Natalie McMaster and a cast of international performers opened the acclaimed Celtic Colours Festival in Port Hawksbury last year. 45 North provided Technical Producer services and equipment rentals to Creative Atlantic, working with Eaton Creative and WLIW – a PBS flagship station. Director Michael Watt was at the helm of a spectacular multi-camera production that will air on PBS later this year. 45 North is proud to be a supplier to the Ocean Entertainment production of Chef at Home, and their new series for the Food Channel, French Food at Home. The long running series, featuring Chef Michael Smith, continues to be an audience favorite for the network, culminating with a Gemini award for Director Trevor Grant last season. This year marks the fourth season that 45 North supplies equipment to the popular series. Once again, New Scotland Pictures has created a Christmas season special for Vision. Celtic Angels features the premiere women performers in the Celtic music realm, including Maggie Smith, who traveled from Scotland to participate in the special. Producer Charlie Cahill continues to create popular and long-running specials using the 45 North multi-camera mobile – an efficient and cost-effective solution. 45 North was contracted by Advanced Systems of Halifax to provide multi-camera coverage of a keynote speech by former President Bill Clinton. 45 North provided a flight-pak system, along with production crew for in-house coverage of the speech to a crowd of over 7500 at the Halifax Metro Centre. 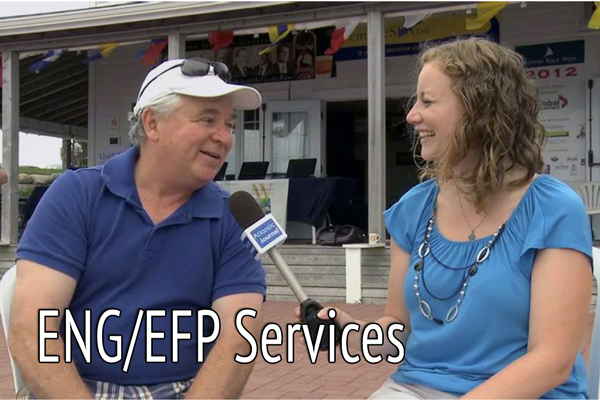 When the Canadian Antiques Roadshow hit the road, it was traveling with two DigiBeta EFP field packages from 45 North. Technical Producer Daniel Cassie called on 45 North to provide complete packages for the field segments, including everything from EZ-Rig camera supports to Warm Cards. 45 North provided a crew and producer to CBS for behind the scenes coverage and interviews of "Jesse Stone: Sea Change". Emmy and Golden Globe Award winner Tom Selleck (Exec Producer) reprises his role as Jesse Stone in this fourth movie in the successful ‘Jesse Stone’ franchise. The movies are based on the best-selling books by Robert B. Parker. 45 North has completed several projects for CPAC over the past year, including pre-election coverage of the 2006 Federal Election at VOCM in Newfoundland. Once again, 45 North utilized the 4 camera mobile to provide live national coverage of a radio phone-in show to allow Canadians to express their ideas about the upcoming election. In addition, 45 North provided single camera coverage of a speech by the Governor General Michael Jean in Halifax, as well on-going contributions to the regular series “Outburst”. 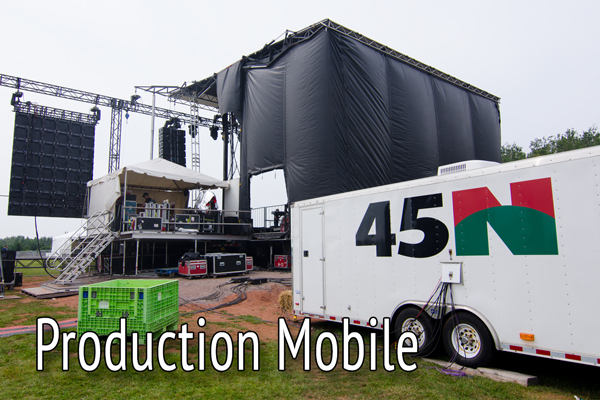 45 North again demonstrated the versatility of its "Air-Pak Mobile" in a week long series of HD projects in Mabou, Cape Breton. Our standard definition system was swapped out for a 4 camera High Definition package that was used for a Rankin Christmas Special, a television pilot titled "Live at the Red Shoe" and a music video for country singer/songwriter JD Clarke. Audio was handled by George Massenburg from Nashville and the shows were directed by Jim Yockey also of Nashville. 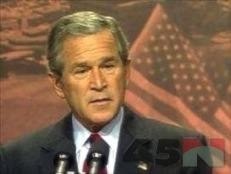 45 North provides live coverage of President Bush's speech in Halifax for NBC's pool feed to the American Networks. Having a previous relationship with NBC News, we were entrusted with the task at Halifax's Pier 21 where the President and Canadian Prime Minister Martin spoke to 300 invited guests. Networks worldwide used the feed including NBC, ABC, CBS, CNN, BBC World, Reuters, and CBC's "The National". 45 North provided crews and equipment for "Superships", 13 one-hour episode television series, shot in Digital Betacam and MiniDV. Five Sony TRV17 camcorders were modified for hazardous use in our special weather-proof housings, designed and built by 45 North. They allowed angles and animated sequences that demonstrated in a most unique way how these vessels do the remarkable things they do. 45 North has managed to provide both our "Air-Pak" and our 30ft. Production Mobile in a unique way which recently paid off on shoots in Atlanta and the Caribbean island of St Maarten, N.A. In October along came a sports television production job with set-ups in Atlanta, Georgia and St. Maarten, N.A in rapid order. 45 North’s Production Mobile Trailer was driven to Atlanta where it was set up for a 3 day “American Strongman” competition. 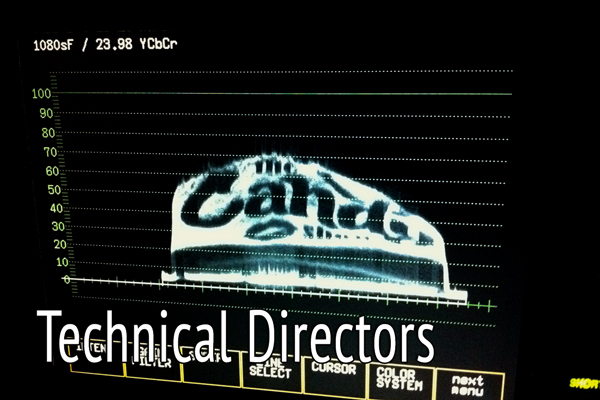 Four Sony D30s and a pencil-cam were switched to a line cut with 3 ISO’s. Eight channels of audio were mixed in the mobile and the whole production went off without a hitch. Upon wrap, in Atlanta, the mobile was reconfigured into our "Air-Pak" configuration in a mere two hours and dropped off to RockIt Cargo for shipping to the island of St Maarten, N.A. Upon arrival the unit was immediately set up in a hotel room near the beach where the International Strongman competition was held. 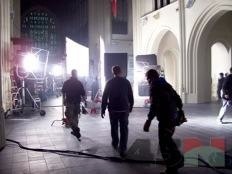 Despite some rain and tremendous heat (110F on the beach) the system worked flawlessly for the 10 day shoot. Upon wrap our "Air-Pak" was immediately shipped back to Atlanta. Within two hours of receiving the equipment the trailer was reconfigured and made the trip back to Canada for another production in Halifax. 45 North was selected to cover the 2015 Clearwater Men's Provincial Championship, the 2015 Nova Scotia Scotties Women's Championship, the 2014 Travellers Curling Club Championship and the 2014 Dave Jones Molson Mayflower Cashpiel, from Curling Clubs in Halifax, NS. We provided HD live stream coverage for desktop, tablet and mobile devices simultaniously from 2 sheets, with 8 cameras and 4 commentators over 21 days and 104 matches between the four events. 45 North live streamed the 10th Anniversary Maritime University Field Lacrosse Championshps 7-9 November 2014 from Wickwire Field, Dalhousie University, Halifax, NS. Three days of fast paced Men's University Field Lacrosse and an exibition Women's Field Lacrosse match were broadcast. 45 North provided three camera coverage, with replays, and commentators over two days of Live Stream Broadcasting of the 2014 Atlantic University Sport - Women's Varsity Rugby Championship from Acadia University in Wolfville, NS. 45 North Broadcast Group, Atlantic Canada’s premier video service provider, was again selected to provide our multi-camera HD live streaming and IMAG coverage of the Dalhousie University Fall Convocation. View it here. 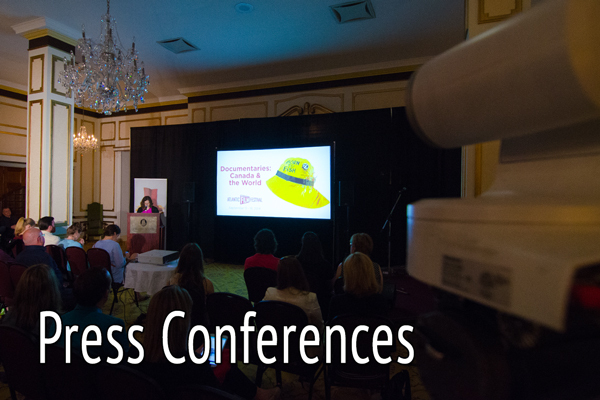 45 North provided multi-camera coverage of this historic event from 24-26 September 2014 held at the Rodd Brudenell River Resort on Prince Edward Island for broadcast on CPAC, the Canadian Public Affairs Channel. 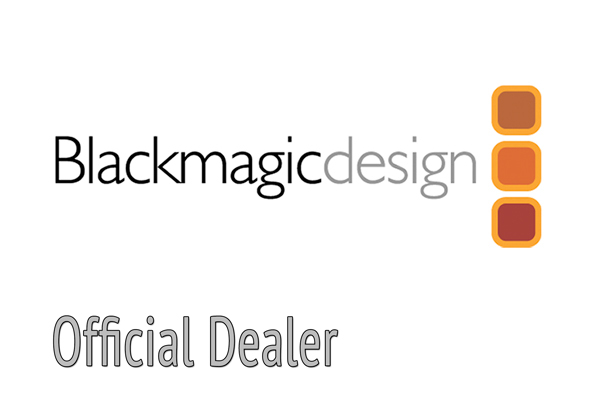 45 North Broadcast Group, Atlantic Canada’s premier video service provider, is proud to have been selected by the 2014 Atlantic Film Festival Platinum Partner Community One to provide their broadcast content from this year's event. From Press Conferences and Preview Shows to the Open and Closing Galas 45 North's ENG Crews, Multi-Camera HD Production Packages and experienced Producers gained accolades for the nearly 15 Hours of content Broadcast from this landmark event. 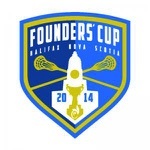 45 North was selected to live stream the 42nd running of the Founders’ Cup, 18-24 August 2014, from the Halifax Forum. Long heralded as the most competitive division in lacrosse, a total of 7 First Place Junior 'B' lacrosse teams from across Canada competed for the coveted Founders’ Cup. 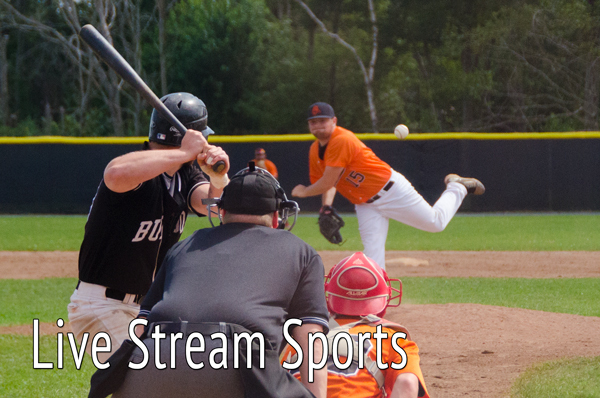 45 North Broadcast Group, Atlantic Canada’s premier video service provider, was selected to live stream the Citi financial Baseball Canada 21U Nationals, from Dartmouth, NS in August 2014. 10 Teams from across Canada competed over 4 days, in mixed weather conditions, to be crowned Men's Champions. Celebrating it's 10th Anniversary, 45 North Broadcast Group was excited to be chosen as the first company to provide multi-camera IMAG coverage for The Dutch Mason Blues Festival. This popular 3 Day Concert Event, held in Truro,NS, featured performances by James Cotton, Gregg Rolie, Doyle Bramhall II, Royal Southern Brotherhood, Rick Derringer, Monster Truck, Wild T & The Spirit, David Wilcox, Head of the Herd, Monkey Junk & 11 more acts. 45 North was pleased to be selected to provide our Multi-Camera IMAG services to the 2014 Rock the Boat MusicFest, a celebration of the 50th anniversary of the Tyne Valley Oyster Festival and the 150th anniversary of the 1864 Charlottetown Conference.The concert at the historic Green Park featured names such as Blue Rodeo, Alan Doyle of Great Big Sea, Jimmy Rankin, Meaghan Blanchard, and Gordie MacKeeman and his Rhythm Boys. 45 North travelled to Grand Falls-Windsor NFLD with our Multi-Camera IMAG systems to provide coverage to the 2014 Salmon Festival Concert. This years lineup included performances from Maroon 5, Pitbull, Simple Plan, American Authors & Virgina In Vegas. 45 North Broadcast Group celebrated Canada's 147th Birthday by providing multi-camera IMAG coverage of Canada Day Celebration Concert, at Alderney Landing in Halifax, Nova Scotia. 45 North Broadcast Group, Atlantic Canada’s premier video service provider, provided our Muli-Camera Live Streaming services to 2014 Canadian Association for University Continuing Education (CAUCE) conference, hosted in Halifax, NS. The conference titled Learning in a Global Context: Think Globally and Act Locally featured a keynote address from renowned humanitarian, Founder and Executive Director of War Child Canada, Dr. Samantha Nutt. 45 North Broadcast Group, Atlantic Canada’s premier video service provider, was again selected to provide our multi-camera HD live streaming and IMAG coverage of the 2014 Dalhousie University Spring Convocation. 45 North live streamed over 14 hours of live qualifying round snooker from Shot'z Billiards, in Dartmouth NS, leading up to the 2015 CSNS Provincial Snooker Championships. 45 North provided live stream coverage of the 2015 Atlantic Ringette Championships, for Bell Aliant Community One, held 30 Jan - 1 Feb 2015 at the St. Margret's Centre Arena, Upper Tantallon, NS broadcasting over 38 matches as teams from PEI, New Brunswick and Nova Scotia competed for gold at this Championship Event. 45 North live streamed Acadia University's Robot Programming Championships the FIRST® LEGO® League (FLL), and Robofest. These Provincial Robot Programming Championships are held each February, involving over 400 participants, with the goals of increasing interest in building digital technology and computer science through activities that feature problem solving and teamwork. 45 North is pleased to continue working with CPAC and providing content for another season of Outburst. The show where Canadians can share their opinions about what’s happening in Canadian politics and other hot-button topics. 45 North was chosen to live stream Extreme Cage Combat 22 from the Halifax Forum, with a multi-camera setup featuring four camera camera coverage of the eight match, Mixed Martial Arts event for Bell Aliant Community One. Community One selected 45 North to live webcast both the round robin playoffs and final championship rounds of the the Canadian Collegiate Athletic Association 2015 Badminton National Championships, for three days of broadcasts from the Canada Games Centre and the University of Kings College, in Halifax, NS. 45 North was selected to live stream four days of championship hockey, for Community One, as the NSMBHL hosted their Provincial Tounament from the East Hants Sportsplex in Lantz, NS. 45 North Broadcast Group was again selected by Acadia University to provide our proven live streamed, multi-camera HD coverage of their Convocation Ceremonies to a global audience from their Wolfville, Nova Scotia campus. The Faculty of Agriculture at Dalhousie University the Canadian agricultural college of Dalhousie University, located in Bible Hill, Nova Scotia, again chose 45 North Broadcast Group provide our multi-camera HD live streaming and IMAG coverage of their 2015 Spring Convocation. View it here. 44 games were Live Streamed over 5 days of competition from the BMO Centre and Scotiabank Centre in Halifax, NS for the 2015 NAHC, an elite, all-star format where the best Bantam/Midget age hockey players are selected to compete on behalf of their Provinces and Territories. 45 North was proud to be selected to live stream the BMO Hockey Heroes Weekend, for Community One. This fundraising event for the Heart & Stroke Foundation allowed participants a once-in-a-lifetime opportunity to play hockey with NHL alumni. Dedicated to giving men the tools to catch testicular cancer early, while acting as a support community for those affected through awareness & educational programs, 45 North was pleased to be selected to provide TCC with our Multi-Camera Live Streaming service for their 2015 Halifax Symposium from the Westin Nova Scotian Hotel. 45 North was proud to be chosen by Bell Aliant TV1 to provide coverage to both their terrestrial channel and live stream broadcasts of the 2015 Subway AUS Loney Bowl, live from Mount Alison University in Sackville, NB. 45 North rolled out our Live HD Production Mobile, with 5 Cameras, 2 channels of Replay and Ross Xpression graphics suite. 45 North was selected to cover the 2016 East Coast Credit Union Tankard and the 2016 Nova Scotia Scotties Women's Championship live from the Mayflower Curling Club in Halifax, NS. 45 North provided our Multi Camera HD live stream coverage & commentary simultaniously from 2 sheets for the 6 days of the event. 45 North was again selected by Bell Aliant TV1 to provide coverage to both their terrestrial channel and live stream broadcasts of the 2015 Subway AUS Women's Hockey Championship from Saint Mary's University, in Halifax, NS. 45 North provided our Live HD Production Mobile to provide the terrestrial and live streamed coverage of this event. 45 North extended our reputation for excellence in curling coverage when we were selected to cover both the 2016 Everest Seniors Championships, from Digby, NS and the 2016 Kings County Canadian Masters Curling Championship live from the Glooscap Curling Club and Wolfville Curling Centre. 45 North Broadcast Group, Atlantic Canada’s premier video service provider, was proud to have again been chosen to provide our multi-camera HD IMAG coverage of hometown hero Sidney Crosby as he and the Stanley Cup paraded through Cole Harbour, NS. This was second Cole Harbour Stanley Cup parade of the Pittsburgh Penguins captain's career and 45 North was selected to provide coverage of the first Parade and Event in 2009. “Extreme Cage Combat” - 45 North provided their Air-Pak Mobile, in 3 camera configuration, with a crew and producer to Advanced Systems to provide live to tape coverage of a mixed martial arts event in Halifax, NS. At the event 45 North demonstrated the versatility of the Sony Anycast System for use in small and medium sized productions. “Caribbean Workout” - 45 North configured a three camera "Air-Pak Mobile" for the production of Season 12 of Caribbean Workout. This long running program, produced by George Athens of Athens Communications was shot over a two week period in beautiful Barbados. A total of 51 episodes were shot at several stunning locations across the island. As a result of assembling a remarkable production team, great locations and committed sponsors, Caribbean Workout has a daily worldwide audience of 180 million viewers. “Caribbean Workout” - Athens Communications in Montreal successfully completed production of Season 13 of Caribbean Workout in beautiful Barbados. 45 North supplied the Air-Pak system configured with 4 cameras, and the engineering talents of Steve Bicknell and Ron Macdonald. Producer George Athens continues to supply this high quality production to OLN, as well as outlets around the world. “Concert For Asia” - 45 North provided its mobile in a 5 camera configuration, with playback facilities, for closed circuit coverage of Concert for Asia at Halifax's Metro Centre. The evening brought out 23 acts of Atlantic Canada's finest musicians and 8,500 of their most generous fans and sponsors. Proceeds to the tune of $105,000 were presented to Oxfam Canada for their work in tsunami relief. Hats off to Asif Illyas of the band MIR for initiating the project and to all the volunteers for donating their time. “CPAC” - 45 North provided our four camera mobile trailer for a live broadcast to CPAC, Canada's Public Affairs Channel. The two-hour broadcast was carried live from VOCM, a well known AM radio station in St. John's, Newfoundland. 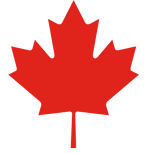 Content included coverage of a live phone-in program where callers from across Canada participated in discussions regarding the upcoming Federal Election. Technical facilities included four camera coverage, with additional audio feeds from VOCM. “Joel Plasket DVD” - 45 North's mobile with six cameras was engaged to record the "Joel Plasket Emergency" before a full house at the Marquee Club in Halifax. Plans are to release the live performance on DVD. Hayward Parrott of Wingit Studios handled audio recording of the show and mixing for the demo. Brian Howald of Wingit handled the video post and graphics. Breandan McGrath was responsible for a lot of sweet-talking to pull the whole thing off. “Singular Series” - 45 North's mobile was used to record "The Singular Series", a series of one person plays, produced by Creative Atlantic for Bravo and CBC. This unique blending of theatre for television was shot in 16:9 using 4 cameras iso'd to Betacam SP recorders for later post. A fifth machine recorded a line cut and together they recorded 10 channels of audio plus the line cut mix. “Maritime Life Corporate Event” - 45 North provided technical and IMAG facilities for the Maritime Life Insurance employee appreciation night, produced by Alexander Richardson Inc., and East Coast Cine. The evening consisted of prepackaged video playback, scan converted text, graphics, and three live cameras switched from two locations in the World Trade Centre in Halifax. Entertainment included Atlantic Cirque, Acrobazia and a surprise musical guest appearance by Bruce Guthro. Lighting and audio were handled by Tour Tech East. “EPK's for Lifetime Network” - 45 North has shot EPK's for several Lifetime movies including "Mom at Sixteen" with Mercedes Ruehl, "Ambulance Girl" with Kathy Bates, and "Dive From Klausen's Pier". Shot in Digital Betacam this scene features an interview with actress Danielle Panabaker who plays Jacey in the film "Mom at Sixteen"